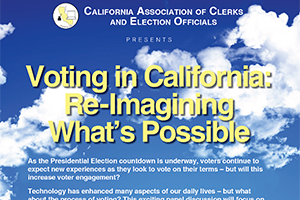 On Thursday, January 14, 2016 CACEO will be presenting a panel discussion - "Voting in California: Re-Imagining What's Possible". If you can't make it to UCLA the event will be broadcast live on the home page of CACEO's website. Check out the website for full details. Emmy Award winning host of NBC4's "News Conference", Conan Nolan, will provide his media perspective on the issue of voting and technology at next week's panel discussion. CACEO Social Media training is coming in February. If you're interested in Southern California locations contact Linda Strickland at 714-567-7620, or in Northern California contact Cindy Jensen at 916-875-6759. Dave Bryan has covered presidential nominating conventions for more than 25 years. He has interviewed several presidents and heads of state. Dave has been a fixture on LA television for decades and will bring unique perspective as our panel moderator. Our recent New Law conference had 541 attendees (a near record) and saw representation from 56 of 58 counties. During the conference 16 panels, presentations or events took place. The agenda covered a broad range of topics for all disciplines. Also during New Law 275 individuals attended CalPEAC (our training program) and 32 graduations took place. Mark your calendars for our annual conference, taking place July 11-15, 2016 in Redondo Beach.